Edward Imeson Horsman (E. I. Horsman) opened a toy company in New York city, NY USA (1865-present) and became a leader in the toy industry. In 1930 the Horsman company acquired the Louis Amberg & Son doll company, their competitor and continued to produce some of Amberg's dolls notably the Vanta Baby. In October 1933 Horsman was purchased and became a subsidiary of the Regal Doll Manufacturing Company. 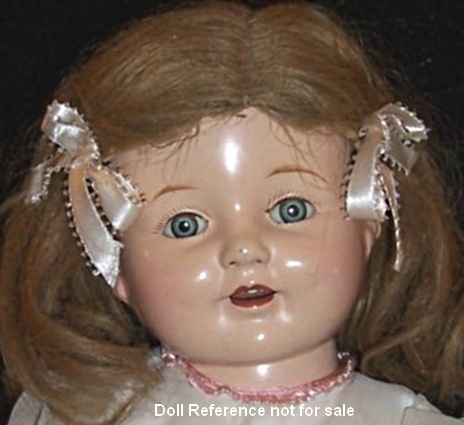 By the 1980s the Horsman name was sold to an Asian company which produced dolls under the name Horsman Ltd., that are today made in Hong Hong, China. 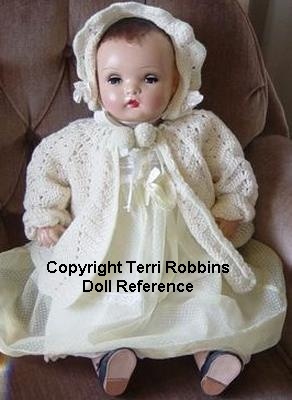 1930s Horsman Rosebud Doll, various sizes to 20" tall, composition swivel shoulder plate head, jointed at the shoulder, with tied on legs, cloth stuffed body with crier, sleep eyes, open mouth with four upper teeth, dimples, mohair wig. Doll mark Rosebud or unmarked, had a paper hang tag with it's name. 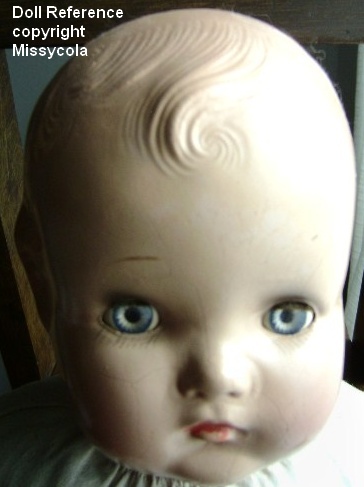 This Rosebud marked head mold was used on other Horsman unnamed dolls, too. 1931 Horsman Babs 12", Sue 14", Jane 17-18" and Nan dolls 20" tall, Horsman's Patsy type competitor; all composition, jointed bodies, molded painted hair, painted or sleep eyes, closed painted mouth, all dolls are unmarked. These are Horsman's Patsy type competitors and replaced the Peggy dolls. Sue at 14" may have a body twist waist. When identifying the Patsy look a likes, try to match the molded hair curls and hair style. Shown on left is a painted eye Babs, 11" and on right is look a like Sue 14", also with painted eyes, wonder why they didn't mark these dolls, as most of Horsman dolls were marked. 1931 Horsman Sue look a like doll, 14"
1931 Horsman Little Buttercup doll, 12" or Horsman Buttercup doll, 16-19" tall, first dolls have a composition head and limbs with cloth baby body, in 1932 Buttercup's head was replaced by hard rubber so it became an all rubber doll, came dressed in a lovely sheer dress with matching bonnet, marked: E.I.H. Co., H © C. or H c Co.
1938 Horsman Baby Buttercup doll, 11", all rubber fully jointed baby doll with dark painted molded hair, brown sleep eyes, open mouth. Doll mark © Horsman. Face mold looks similar to the Sister and Whatsit dolls with an open mouth. 1931 Little Buttercup doll, 12"
1937 Horsman Jo Jo doll, 12" tall, all composition, came as both a boy or girl, has molded hair underneath the mohair wig, Jo Jo has a long mohair wig in pigtails, closed rosebud mouth, tin painted or sleep brown eyes, doll mark Jo-Jo © 1937 Horsman. Shown wearing original clothing. 1937 Jo Jo doll, 12"
1937 Horsman Whatsit Dolls, dolls are 14 or 16" tall, all composition with molded hair, right arm is bent (like Patsy) came dressed in a cotton dress with leather shoes; Jeanie has molded hair with a small topknot, tin painted eyes, mama crier, Naughty Sue with a topknot molded hair, Roberta with brown molded hair in braids curled into a bun over each ear. Dolls are marked with their Name © 1937 Horsman. 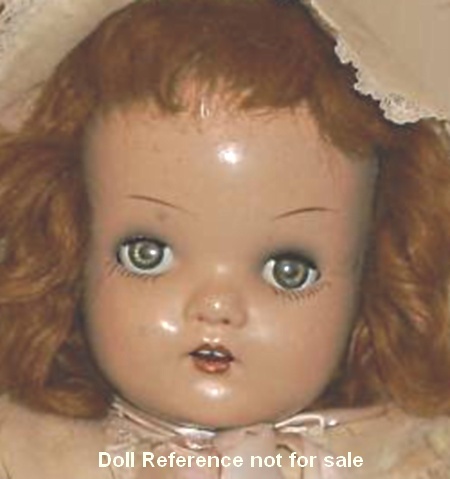 Doll shown is possibly an earlier issue as she does not have the 1937 in the marking, unless it is lower on the neck and didn't show in photo. 1937 Horsman Brother doll, 21" tall and Horsman Sister doll, 23" tall, both have composition head and limbs, painted tin sleep eyes, molded hair, she with a small topknot, cloth body. Both have comical faces with small puckered closed mouth, hers more so than his Doll mark: Brother or Sister © 1937 Horsman. Photo's courtesy of Ronsfancy, dolls are redressed. 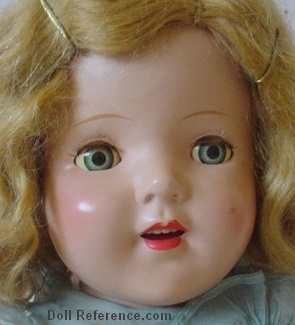 1938 Horsman Sweetheart doll, A Horsman Art Doll, 21, 24 or 28" tall, all composition with hard rubber unbreakable arms, slender jointed body, brown mohair wig, green sleep eyes, open mouth with six upper teeth. Horsman Sweetheart dolls are unmarked. The Horsman ad reads: A true reproduction of girls between the ages of 10 and 16, they are dressed in the latest fashions, sculpted by the famous sculptor Ernesto Peruggi. 1939 Horsman Baby Precious doll, 18-21" tall, composition flange head and composition wired on partial or full arms & upper legs, stuffed cloth body with stitched hip joints, some dolls have a mohair wig over molded hair, sleep eyes, closed mouth. Doll marked A Horsman Doll or unmarked. 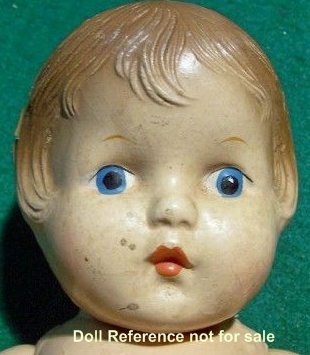 Baby Precious was produced in hard plastic in 1950s and later. Also came in a black version. 1939 Baby Precious doll 19"
1939-1940s Horsman Gold Medal dolls, 13-18" tall, all composition, some have slim child bodies others are chubbier toddlers, sleep eyes, closed mouth, some dolls came with a tag that said "Gold Medal Doll" doll mark HORSMAN or unmarked with a hangtag. 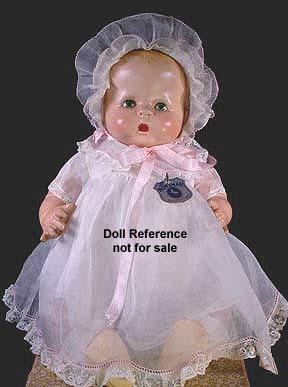 See 1939 doll shown below, too. 1939+ Gold Medal Doll 18"
1939+ Horsman Gold Medal Baby doll, 16-24" tall (probably other sizes too), composition flange head, arms & lower legs with cloth stuffed body or all composition jointed body, molded painted hair beneath wig, sleep eyes, open mouth with two upper teeth, some dolls are unmarked or marked: A Horsman Doll. 1939+ Gold Medal Baby doll, 21"
1940s Horsman Enchanting Eyes doll, 15-16" tall (probably other sizes as well), composition flange head, full or partial composition arms & legs, cloth stuffed body, brown painted molded hair, sleep flirty eyes that also move side to side (some have been found with sleep non-flirty eyes too), closed mouth. 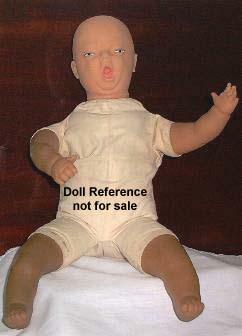 Doll marked: A Horsman Doll. 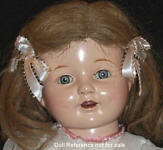 1940s Enchanting Eyes doll, 15"
ca. 1940s Horsman Art Doll, 11" tall, all composition, molded painted hair, painted side glancing eyes, open mouth, composition jointed body, wearing original clothing bonnet & shoes. Unknown how marked. Box states A Horsman Art Doll, # 4391, doll probably had a hangtag as well. ca. 1940s Horsman Art Doll, 11"
1942 Horsman Bright Star doll, 12-20" tall, all composition, some have braided wigs, but their are actually several doll molds that are all Bright Star dolls. Dolls are unmarked. ca. 1944 Bright Star doll 16"
1946 Horsman Betty Bedtime doll, 18" tall, cloth body, composition head (with either molded hair or wigged hair) lower arms and legs, came in a box that converted into a bed for the doll to sleep on, wore a white dress with open eyelet weave, trimmed with ribbon, matching bonnet, socks and shoes. 1946 Betty Bedtime doll, 18"
1949 Horsman Squalling Baby doll, 19" tall, soft vinyl head and limbs (vinyl forearms, hands and legs to just above the knees), cloth body, molded hair, painted blue squinting eyes, red angry painted cheeks, wide open mouth - like it's crying or "squalling", (sometimes) doll marked Corp. Lastic Plastic 49. 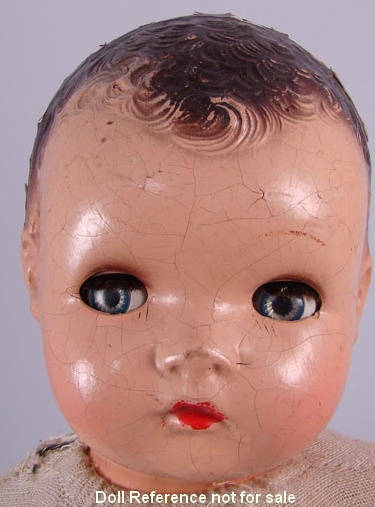 1949 Horsman Squalling Baby doll, 16" tall, like the above doll, slight changes - only head, hands and feet are vinyl, rest is cloth, this one is a squeaker, crier, doll is unmarked, same squalling face. 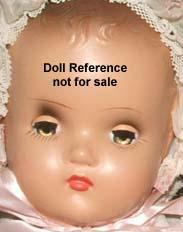 Note: not everyone agrees that either Squalling Baby doll was made by Horsman. Ideal and Fleischaker Novelty also made these type squalling dolls. 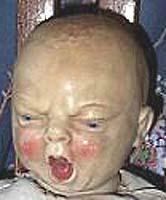 Georgene Averill has an earlier composition and cloth, Baby Yawn doll ca. 1930s, who has a yawning face with the closed eyes and open mouth. 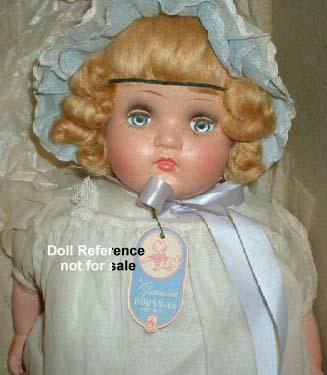 1949 Squalling Baby doll 19"